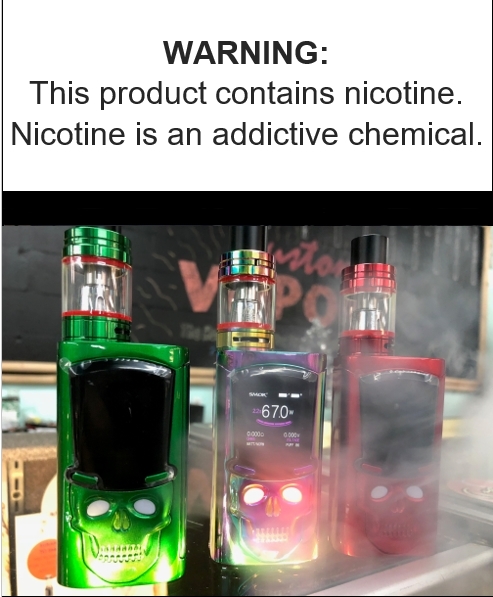 The SMOK S-PRIV 225W TC Starter Kit presents a spooky chassis with 12-Color LED in the Skull Eyes design while utilizing the cloud-chasing performance of a Smoktech premier chipset to pair with the Light Edition of the TFV8 Big Baby Tank. The architecture structure of the S-PRIV 225W Box Mod delivers a smooth curvature structure with ergonomic squeeze-to-fire mechanism that fits comfortability in-hand, a nice added touch to one of the most unique design box mod in the market. The hat-shaped OLED display features high-definition UI with full-color adjustments, providing operational data in an organized manner. The OLED screen sits on top of a well-designed Skull with built-in LED sparkling eyes for a futuristic functionality. The S-PRIV integrates a high-performance chipset with 225W of maximum wattage and a plethora of output adjustments ranging from temperature control suite with added Memory Mode for increased precision as well a full-suite of protection. The S-PRIV Box Mod is paired with theTFV8 Big Baby Tank -Light Edition, featuring a 25mm chassis with 5mL of maximum capacity, signature hinged top-fill, massive dual bottom airslots, LED Light-Up capacity, and the flavorful TFV8 Baby Coil Family.